Wow, this one rates a 5 out of 5!! AND let me be the first to say that that does NOT often happen! Soo easy and fast!! AND absolutely delicious! 1. Always dry the chicken thoroughly (it will brown better). 3. When adding the Lime Juice (deglaze), stir vigorously to get all flavours intermingled. Heat Oil. Sear Chicken. Cook for 5 minutes on each side. Remove Chicken. Bring to boil. Remove from heat. Stir well. Drizzle sauce over chicken. 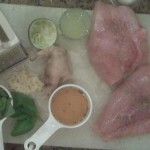 This entry was posted in Cooking and tagged 5, Chicken, Cooking, Ginger, Limey. Bookmark the permalink. 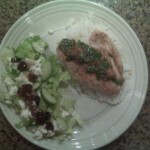 Last night I made the Ginger Limey Chicken and it was very good. However I liked the sole fish better. Thank you for the ideas.